From Daily Mail: The Chicago prosecutor whose office dismissed charges against Jussie Smollett defended the decision on Saturday, saying the Empire actor was treated no differently than thousands of other defendants whose charges were similarly dropped since she took office. Cook County State’s Attorney Kim Foxx made the comments during a defiant and emotional address at the Rev. Jesse Jackson Sr.’s Rainbow Push Coalition. Foxx openly wondered if her race had something to do with the harsh criticism she’s faced since her office announced that charges against Smollett had been dropped, WGN-TV reported. The actor was accused of staging what he claimed to be a racist and homophobic attack in January. ‘I have been asking myself for the last two weeks what is this really about,’ she said. Foxx, who recused herself from the case after she communicating with a Smollett relative during the probe, reiterated that she welcomes of an independent investigation into the way she and her office handled the case. She also reminded the audience that her office did the same thing for the nearly 6,000 low-level defendants who had their charges dropped with ‘deferred prosecution’ during her tenure. ‘In my 48 years of practice, I certainly have never seen a deferred prosecution done like that,’ Richard Kling, an IIT-Kent Law School professor told the Chicago Sun-Times last week. On February 21, 2019, actor Jussie Smollett, 36, turned himself in to Chicago police after he was charged with a felony for lying to police when he claimed to be the victim of a racist and homophobic attack. 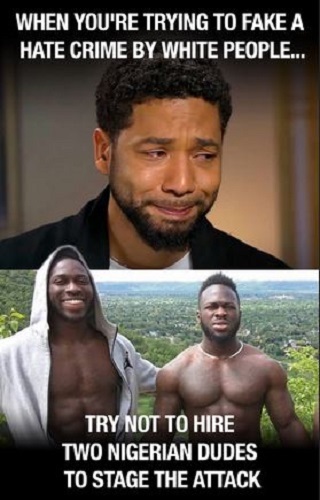 Smollett, best known for the Fox TV show Empire, who is both black and “gay”, had told police that on January 29, at around 1:30 a.m., he was accosted by two men in downtown Chicago who shouted racist and homophobic slurs, beat him up, poured bleach on him, wrapped a noose around his neck, and warned him that “This is MAGA country!”– a reference to President Trump’s “Make America Great Again” slogan. On the day of his arrest, at a press conference, Chicago police superintendent Eddie Johnson fumed with righteous indigation that as a black man who’s grown up in Chicago, he’s “offended” and “angry” with Smollett taking advantage of the pain and anger and racism to promote his acting career. We were told Smollett could face probation or up to three years in prison if convicted. But the news today is that Chicago prosecutors have dropped all charges — and the fingerprints of the Obamas and George Soros are all over this stunning reversal. The criminal case against “Empire” actor Jussie Smollett took a stunning turn Tuesday when Chicago prosecutors abruptly dropped all of the charges — after slapping him with 16 felony counts for allegedly staging a hate crime attack. The Cook County State’s Attorney’s Office only offered a vague explanation why it was allowing Smollett to skate in the case following a surprise, five-minute court appearance in which Judge Steven Watkins sealed the case file. “After reviewing all of the facts and circumstances of the case, including Mr. Smollet’s volunteer service in the community and agreement to forfeit his bond to the City of Chicago, we believe this outcome is a just disposition and appropriate resolution to this case,” the office said. The move comes just a week after Chicago’s police union demanded a federal probe into the county’s top prosecutor for allegedly interfering in the case after being contacted by Michelle Obama’s former chief of staff. The Fraternal Order of Police, which represents the department’s rank-and-file, sent a letter asking the Department of Justice to probe Cook County State’s Attorney Kim Foxx. Foxx had recused herself from the case in February because she had reached out to one of Smollett’s relatives and acted as a go-between with the cops. “Jussie was attacked by two people he was unable to identify on January 29. He was a victim who was vilified and made to appear as a perpetrator as a result of false and inappropriate remarks made to the public causing an inappropriate rush to judgment. There is no longer justice in America. The America I thought I once knew is gone and may be never was.